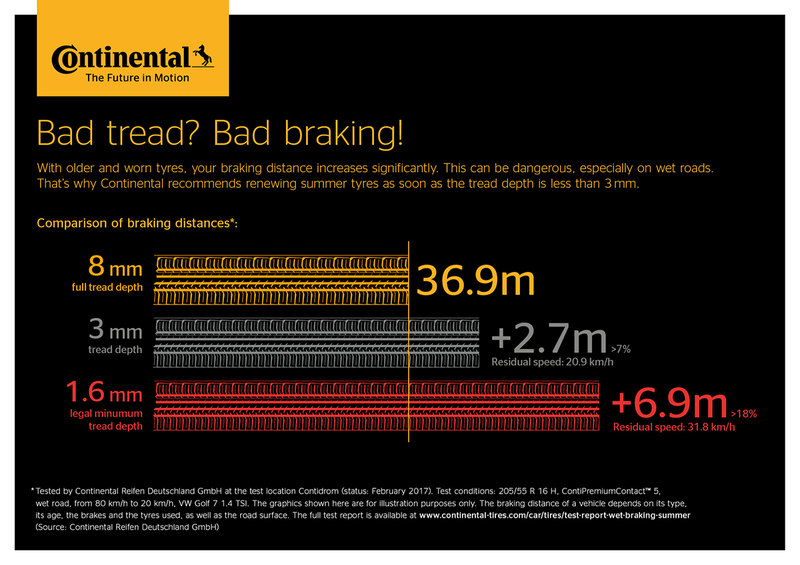 As the summer holidays commence and multiple road user groups take to setting off on planned travels, Continental is urging motorists to be prepared for trips either abroad or as part of the Staycation trend, stressing the importance of tyre safety for all motorists. As a corporate partner of TyreSafe, the UK road safety charity, Continental is supporting their summer campaign to raise awareness of the need for driver diligence over the summer. In the UK, one third of all tyre related incidents happen during the summer. With 57% of Britons enjoying a staycation in the UK this year, TyreSafe aim to minimise tyre caused accidents – helping the UK public enjoy the sunshine this summer. Department for Transport data shows in the month of July tyre related incidents are at their highest. A combination of factors, from unexpected bad weather and drivers unfamiliar with country roads, to long journeys with fully-laden cars – means that summer driving carries with it a number of additional risks. Mark Griffiths, safety expert at Continental Tyres, said: “As part of our Vision Zero initiative which aims for zero accidents, injuries or fatalities on our roads – we are keen to make motorists aware of the small steps they can take to make their journey safer this summer. “With a spell of good weather, it is easy to get a little complaisant in a way motorists might not be in the winter when they are braced for rain, snow and ice. “It is vital that, whatever the season, people remain alert to changes in conditions and ensure that their tyres are in top condition. While temperature records have been broken this year, in the UK it rains an average of 156.2 days of the year, meaning drivers risk being caught off guard when braking counts in a critical situation. On summer tyres, braking distances on wet roads at 60 mph increase by as much as 15 metres – making it vital that drivers remain vigilant, checking they have adequate tread depth and correct inflation. TyreSafe’s Guide to Summer Motoring takes an informative approach to educating motorists about the essential checks they should carry out.